Good morning! Happy Monday to you all! I have a brand new Meal Prep Monday here for your enjoyment. Check it out. 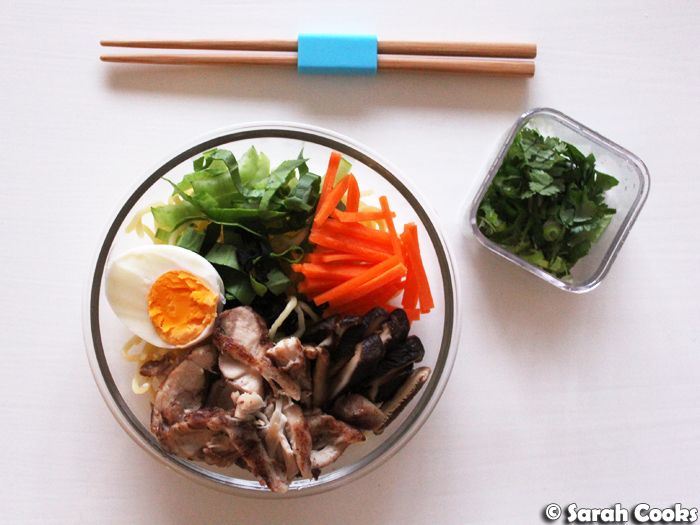 Instant Noodles with 5-spice chicken, shiitake mushrooms, wakame seaweed, carrots, bok choy and a hard-boiled egg. So, a couple of weeks ago, Sandra and I popped into an upmarket faux-Japanese noodle bar for a quick dinner after drinks in the city. I had soba noodles in a dashi broth, with chicken, egg and vegetables. The food wasn't particularly impressive, but it did remind me that back in my uni days, one of my staple meals, both in restaurants and at home, was noodles in dashi broth. This was back when Wagamama was huge, and before ramen became a Thing! It struck me that a nice bowl of soup noodles, with lots of fresh vegetables in it, would make an excellent meal prep for winter. Obviously having noodles sit in broth overnight is not ideal, as the noodles expand and go soggy, so I thought it would be good to set up the bowls in advance (including dashi stock powder), and just pour boiling water on them before I ate them. Just like instant noodles! Whaaaat! Now whilst this is a great idea, it certainly wasn't an original one. A quick Google and Pinterest search revealed that many people have had this idea before me! Namely J. Kenji Alt Lopez from The Food Lab, and before him, Hugh Fearnley-Whittingstall. Well, it's popular because it's good! Super easy and perfect for meal prep! I used this set of glass lunch bowls with matching lids; I've seen lots of people online do these with mason or killner jars. (So instagrammable). For my particular bowls, I used par-cooked ramen noodles that come in individual packets and just need a few minutes steeping in boiling water to be cooked through. (The brand of noodles I bought come in "single serves" of 150 grams each, but I found half of the packet to be just the right amount for one serving). 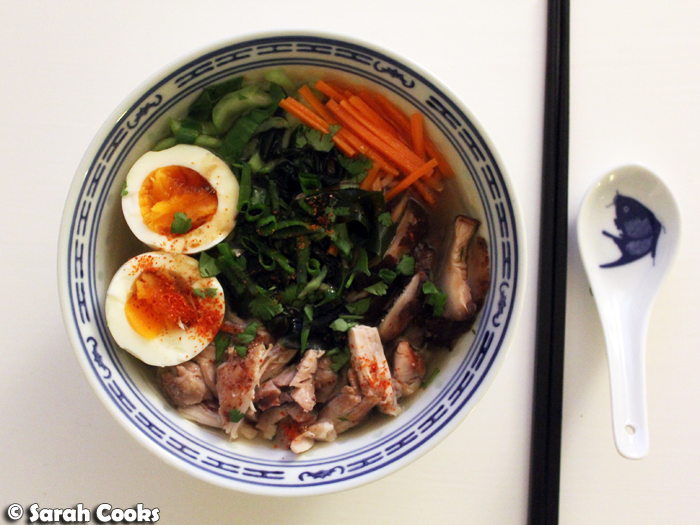 I topped them with a little instant dashi powder, julienned carrots, finely sliced bok choy, soaked-and-sliced shiitake mushrooms, dried wakame seaweed, 5-spice-flavoured grilled chicken, and an egg! I generally prefer soft-boiled eggs with noodle soup, but seeing as these had to last for a few days, I decided to go hard-boiled. The vegetables don't really cook in the hot water, just soften, so you need to use vegetables that you're happy to eat crunchy. I also found that the meals didn't get piping hot, especially if I'd had the bowls in the fridge all morning (perhaps the hot water tap at my work isn't that hot!) So after covering the meals with hot water and popping the lid on, I gave them a short burst in the microwave to get them properly hot. I was really pleased with these! I was worried they might be bland, but the combo of dashi powder, shiitake mushrooms and wakame seaweed gave these super umami power. The five-spice powder on the chicken also added flavour to the soup! I found the bowls filling and nourishing, but not heavy. And I loved having lots of different vegetables each lunch! 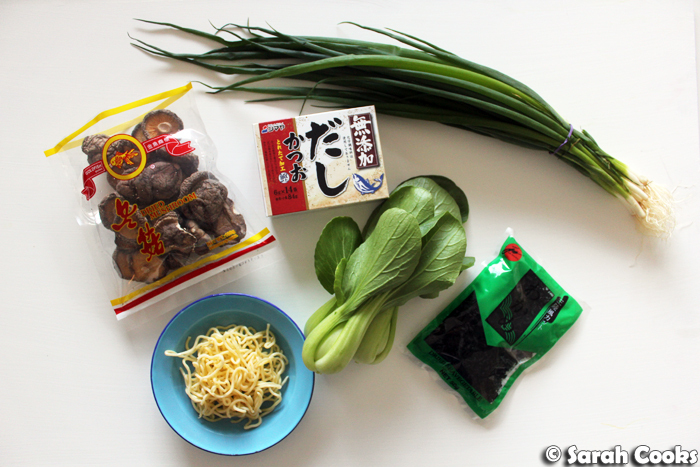 (Wakame, in particular, is supposed to be full of nutrients and inordinately good for you). Here's a bonus one! 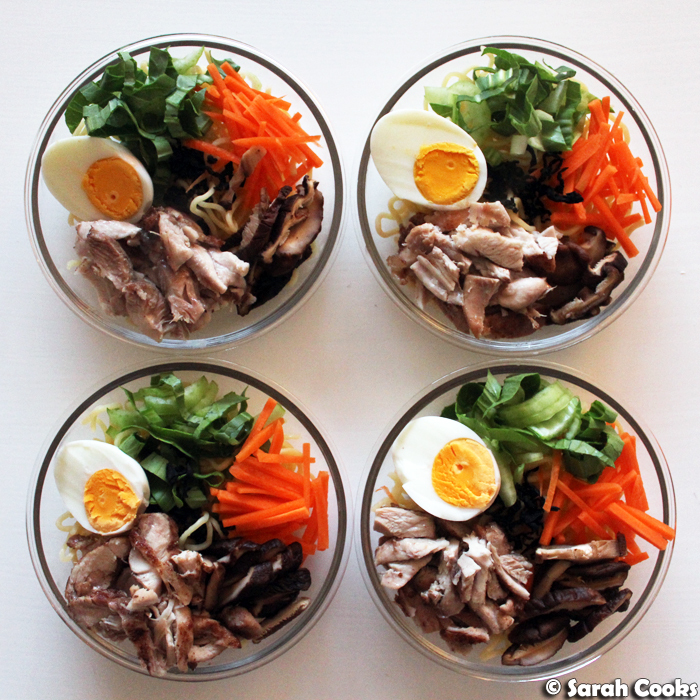 I made the bowls on a Sunday evening, and made an extra portion so I could have it for dinner that night. Oishii! Place the dried shiitake mushrooms into a bowl and cover with boiling water from the kettle. Set aside for 30 minutes to soften. Drain and slice the mushrooms into thin pieces. Place the eggs in a small saucepan and cover with cold water. Place over a medium heat and bring to the boil. As soon as it boiled, clamp on a lid and turn the heat off. Leave for exactly 8 minutes, then drain and rinse under cold water. When cool enough to handle, peel and cut in half. Brush the chicken thighs with vegetable oil and sprinkle with five spice power. Cook in a non stick pan on medium-high heat for 10-15 minutes, turning once, or until cooked through. Set aside and allow to rest. Shred or slice the chicken. Wash the bok choy and cut crosswise into thin pieces. Divide the ramen noodles between four serving containers. Sprinkle 3 grams dashi powder into each container. (I have digital scales, which made this easier, but otherwise just sprinkle roughly half a sachet into each container). Divide the sliced mushrooms, hardboiled eggs, carrot, bok choy and wakame between the containers. Cover and store in the fridge! Just before eating, pour 300 millilitres boiling water over your noodle bowl and cover. Allow to sit for 3 minutes. Remove the cover and sprinkle with coriander and spring onions to serve.